Riverdale Mediation Ltd. recognizes the importance of privacy and the sensitivity of personal information. We have a professional obligation to keep confidential all information we receive within a mediation relationship. Our relationship with you is founded on trust and we are committed to maintaining that trust. We are committed to protecting any personal information we hold. From January 1, 2004, all businesses engaged in commercial activities must comply with the Personal Information Protection and Electronic Documents Act (the “Act”) and the Canadian Standards Association Model Code for the protection of personal information, which it incorporates. The Act gives you rights concerning the privacy of your personal information. Riverdale Mediation Ltd. is responsible for the personal information we collect and hold. To ensure this accountability, we have developed this policy and trained our associates and support staff about our policies and practices. for internal purposes including the professional development of associates and interns. Personal information is any information that identifies you, or by which your identity could be deduced. We collect and use your personal information in order to provide you with mediation services. Our firm restricts the collection of personal information only to that information that is necessary for the purposes noted above. We are committed to collecting personal information in a fair, open and lawful manner. Wherever possible, we collect your personal information directly from you at the start of a file and in the course of our retained relationship. In some cases, we shall ask you to specifically consent if we collect, use, or disclose your personal information. Other times, your consent may be implied through your conduct with us. For example, if you complete a form that is on our website and send it to us, or if you provide information about your case to our staff in the FLIC, your consent to collect and use that information, in accordance with the terms of this policy, is implied. Likewise, if you send us an email or respond to an email from us, we will imply your consent to collect and use your information in accordance with the terms of this policy. And we will imply your consent to share your personal information with those who you advise us are your agents, such as your lawyer, unless you advise us otherwise in writing. We use your personal information to provide services to you and to administer our client (time and billing) databases. We also maintain records such as those of mediation and information services encounters and outcomes, and provide such data on an anonymous basis to the Ministry of the Attorney General. We are obliged for legal and tax purposes to retain our client files after the contract for services has ended. 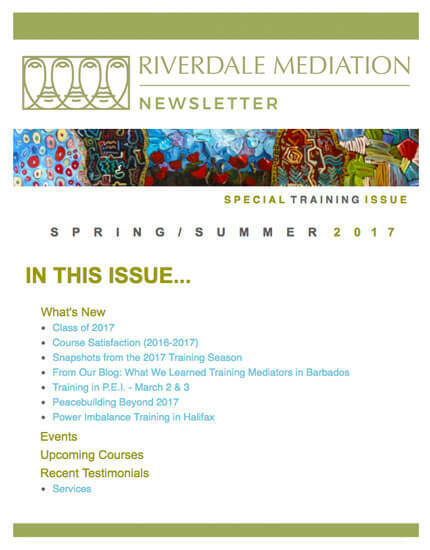 Riverdale Mediation Ltd. does not disclose your personal information to any third party to enable them to market their products and services. For example, we do not provide our client mailing lists to other professional services. Our firm stores and maintains personal information in conformity with the requirements of the Personal Information Protection and Electronic Documents Act and the model code for the protection of personal information created and approved by the Canadian Standards Association. We ensure that any of our employees, associates or interns who deal with personal information are properly trained and are aware of the necessary and appropriate measures required to protect your personal information. You should be aware that e-mail is not a 100% secure medium. You should be aware of this when contacting us to send or receive personal or confidential information. In particular, we require you to send us confidential information at the intake stage of all mediation processes. We routinely provide scheduling information, progress reports, memoranda, and other communications via email to parties and to their lawyers. If you prefer, you may fax or mail us a hard copy of your intake form or any other communications, and may request us to communicate with you in a similar fashion. If you have any questions or wish to access your personal information, please write to our Privacy Contact at Riverdale Mediation Ltd., 393 University Ave. Suite 2000, Toronto ON, M5G 1E6, attention: Hilary Linton. © 2017 Riverdale Mediation Ltd. All rights reserved.